In Chicago a woman is being arrested for defying a Chicago edict banning “abbreviated bathing suits” on beaches. 1922. Dressed in what would look to us like very conservative swimwear today, the women were being arrested for defying a ban on wearing their ‘brief swimsuits’ in public. In the early 1900s, modesty laws were very strict and required most women to wear long one piece garments as well as stockings. Even the men without shirts were banned from the beaches in Atlantic City, New Jersey, the reason being that the city didn’t want “gorillas on our beaches”. During this time, swimming became less about health and more about pleasure. Into the early 1900s, women’s swimming costumes were cumbersome, with high necks, long sleeves, skirts and pants. Often they were made of wool. The one-piece swimming suit, brought to the public attention by swimmer, vaudeville and film star Annette Kellerman, was legally banned in parts of the U.S. In 1908 Kellerman was arrested on a Boston beach for indecent exposure because her swimsuit showed arms, legs and the neck, a costume she adopted from England, and which was similar to men’s swimsuits of the time. Kellerman changed the suit to have long arms and legs and a collar, still keeping the close fit that revealed the shapes underneath. Despite opposition from some groups, the form-fitting style proved popular. It was not long before swimwear started to shrink further. At first arms were exposed and then legs up to mid-thigh. Necklines receded from around the neck down to around the top of the bosom. The development of new fabrics allowed for new varieties of more comfortable and practical swimwear. By the 1930s the necklines of women’s swimwear plunged at the back, sleeves disappeared and sides were cut away and tightened. With the development of new clothing materials, particularly latex and nylon, through the 1930s swimsuits gradually began hugging the body, with shoulder straps that could be lowered for tanning. 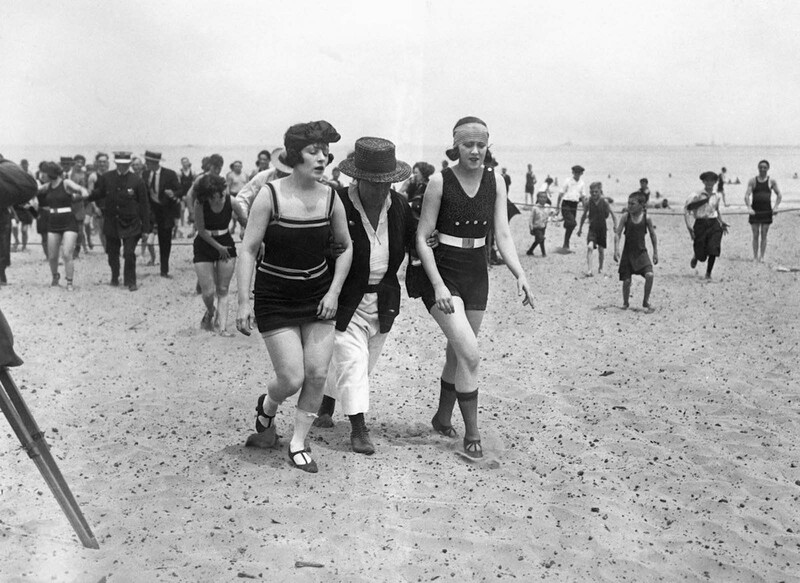 Two bathers being escorted off the beach by a police woman. Chicago, 1922. 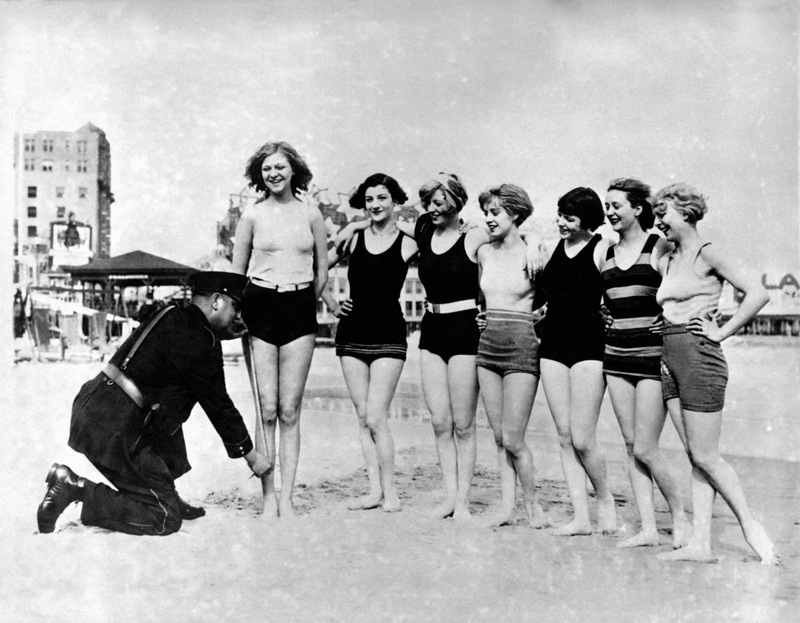 Chicago policewomen checking for violations of the bathing suit-length laws. 1922. 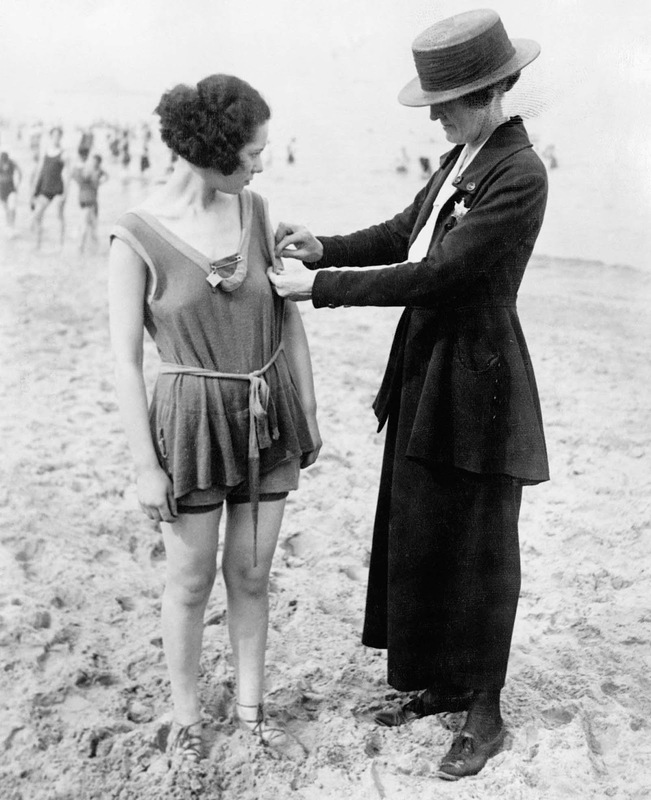 “Smokey” Buchanan from the West Palm Beach police force, measuring the bathing suit of Betty Fringle on Palm Beach, to ensure that it conforms with regulations introduced by the beach censors. 1925. A policeman measuring the swimming costumes of women on the beach in the 1920s. Women found to be breaking the rules were either asked to leave the beach or made to cover up. 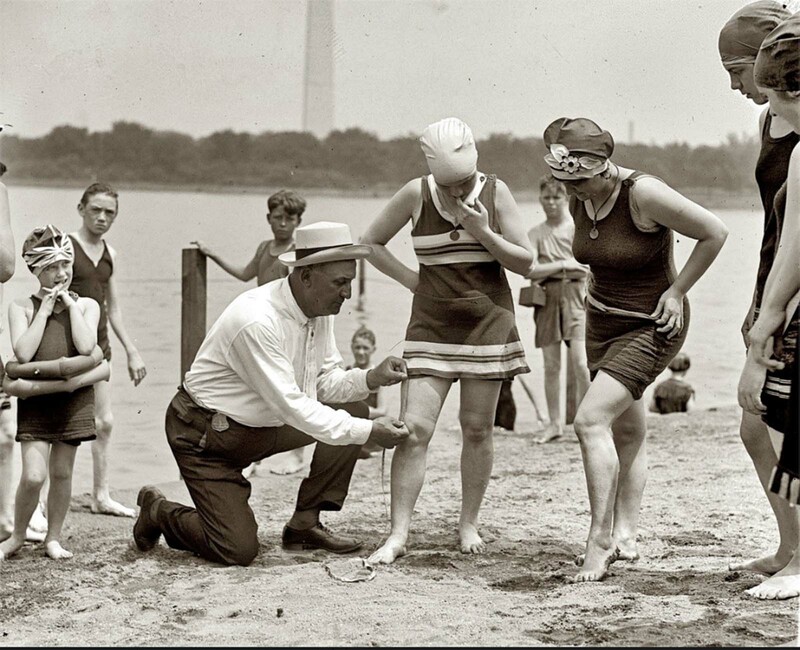 Washington policeman Bill Norton measuring the distance between knee and suit at the Tidal Basin bathing beach after Col. Sherrill, Superintendent of Public Buildings and Grounds, issued an order that suits not be over six inches above the knee. 1922.